Painter Jack Portland combines elements of surrealism and expressionism with a patterned and abstract vocabulary. He incorporates images ranging from landscape to still life to a synopsis of personal forms. Since 1993, he has divided his time between Portland, Oregon and Italy, which has dramatically influenced his work. In the past, his imagery primarily featured abstract forms, some architectural, some organic, that used repetition and pattern to create a dream-like, fantasy world. More recently, he combines a rich color palette with his merged imagery of landscape and still life with his iconic abstracted forms; the compositions are looser, and elements and line overlap. Landscape vignettes enigmatically merge with abstract shapes and patterns. His paintings allude to place while capturing the sensuous nature and imaginative beauty of the world around him. Born in California, Jack Portland came to Oregon in the 1960s. He graduated from the Museum Art School, now the Pacific Northwest College of Art, in 1971 and established himself in Portland as an artist and teacher. 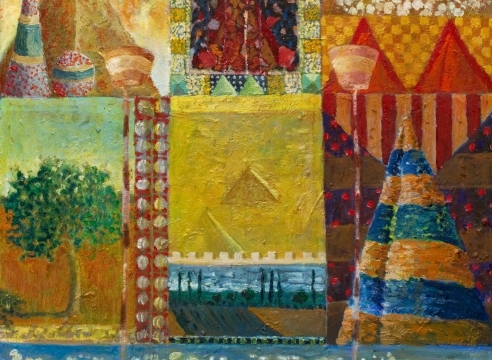 His work has been exhibited nationally and internationally and is represented in numerous private and public collections including the Portland Art Museum; the Seattle Art Museum; the Museum of Contemporary Art, Honolulu, HI; the Carnegie Institute in Pittsburgh, PA; the Brooklyn Museum, NY; and the National Gallery of Art, Washington D.C. Among his public commissions are the Portland International Airport, Western Oregon University, and the Southeast Portland Police Precinct. A recent commission is a fresco for the Belluschi-designed St. Philip Neri Parish in Portland. His well-known commission for the Portland International Airport has recently been re-sited and can now be seen in Concourse A.